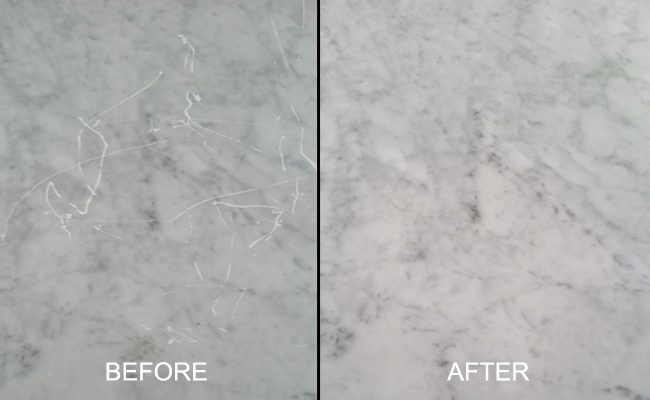 We removed these deep scratches, restoring the beautiful honed marble table finish. In Los Angeles, California, we get a lot of calls from home and business owners looking for marble repair and restoration services. In this case, homeowners called us because their brand new table was delivered with scratches. We used only the very best equipment, techniques and supplies to restore this marble table top. First, we honed the stone to remove the scratches and prepare the stone for polishing. We used progressively finer grits to restore the beautiful honed finish. Finally, we sealed the marble table top to inhibit staining. Visit our Marble Services page or watch this short video to learn more about professional marble restoration services or this video to learn more about natural stone restoration for commercial properties. Maintaining the highest quality standards, we expertly resolve any problems associated with natural stone, tile and grout. In addition, we make it a point to educate our customers on proper stone care, offering helpful tips and articles and providing expert advice for specific questions or concerns. Contact us online or call 619-246-0240 today for a free estimate on marble scratch removal, honing, and sealing services in Los Angeles and throughout the San Diego area.